Summary: When Rani’s father leaves her mother for another woman, Rani shaves her head in mourning. The visibility of her act of rebellion propels her onto the stage as a hip-hop performer and into a romantic relationship with a man who is much older. The whirlwind romance, coming on the heels of her father’s abandonment, make her begin to understand how her father’s sexual abuse wounded her in deeper ways than she, or her mother, have ever been able to acknowledge. Meanwhile, she seeks solace in making lyrics and performing as well as in her boyfriend’s arms. Rani’s friends warn her about him but she fails to listen, feeling as though she finally has something and somebody that makes her feel good about herself—not recognizing that her own talent in hip-hop makes her feel secure, smart, and confident in ways her boyfriend does not. Indeed, as the relationship continues, Rani discovers her boyfriend’s drug use and falls victim to his abuse. Losing herself just as she finds herself, Rani discovers her need to speak out against those who would silence her—no matter the personal danger it leads her into. In her day-to-day life, Rani cannot see her own value. She’s unable to understand her worth without her father’s attention. For years she had measured her self-worth by his actions and words. When he not only leaves, but lavishes his attention on someone else, Rani is devastated. This is not a book filled with sweetness and light. Rani is violated, thrown aside and left wounded. There are some very raw scenes to get through, but readers also get to see Rani step out in powerful ways as she learns about herself and her strengths. Her emotional journey is compelling. Rani survived abuse at the hands of her father and is working to change her patterns of behavior. She doesn’t want to seek his approval anymore. With him in another relationship, that becomes easier to a certain degree, but she falls into the same habits with her new, much older boyfriend. During this trying time, Rani is not only moving away from her father, she’s attempting to close the gap with her mother. She wants love, comfort and support from her mother, but these things aren’t often given. The years of isolation have put a wedge between the two and change is slow to come. Rani has complex emotions. She feels a sense of guilt because of her relationship with her father and feels sorry for her mother. She also can’t help but be angry that her mother didn’t keep her safe over the years whether that was through ignorance, fear, or something more deliberate. I found their changing relationship intriguing. I was a little surprised at how quickly some things resolved, but thought things developed in a logical way. Rani has very few friends, but the ones she has are extremely supportive. They’re close, but they are hiding several things from her. She has a much older boyfriend, but one of her friends is also someone she fantasizes about so those relationships get complicated. Aside from the abusive relationship, mother/daughter issues, friends, boyfriends, and hip hop music there was another added layer – activism. This is extremely timely with the issues surrounding the Dakota Access pipeline. Rani, her father and many other people are working to protect the water supply on their island home which involves a fight against a proposed pipeline. Native Hawaiian sovereignty is also part of the discussion. I appreciated the inclusion of the activism because it added depth to the characters and the story line. This may be one layer too many for some readers, but I’m glad it’s part of the story. Recommendation: Get it soon especially if you enjoy references to 90s hip hop. 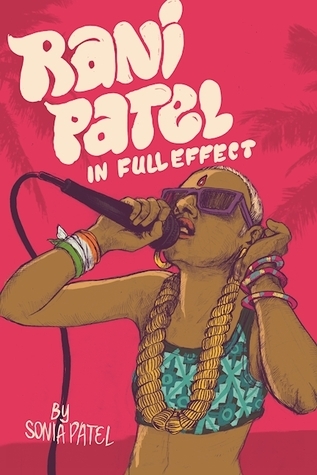 I think I missed the effect of some of those references, but Rani Patel’s story still spoke to me with power and intensity. I felt Rani’s pain, but also her energy, determination and her hope for healing. ps is it comic style or all text? b/c I love the cover art. Hi Elizabeth. This is a book in all text. I too love the cover art. Great review, I need to read this!